Kyle Connor has been skating on a rink in front of fans since the Winnipeg Jets forward was three years old. WINNIPEG — Kyle Connor has been skating on a rink in front of fans since the Winnipeg Jets forward was three years old. But the ice wasn't real back then, and neither were the fans. Connor's father had painted ice on the basement floor of their New Baltimore, Mich., home, adding more brush strokes to create a wall mural of boards and fans. Kyle would slip on a pair of Rollerblades and zip around. "He'd just go down there all day long and just shoot pucks and skate around and stick handle. It was funny," Joe Connor said in a recent phone interview. "And then I branched him over to ice hockey." That transition on their small, backyard rink went smoothly. "As soon as he put on the skates, he just stood straight up and had no problem," Joe said. "He didn't even use a chair or nothing." The family soon moved to nearby Shelby Township, choosing a home with a large yard so Joe could build a big rink with floodlights. Connor was four when he joined a team coached by his dad. It included brother, Brendon, who's two years older. "Kyle was skating with kids two and three years older than him and he was still one of the best ones out there when we were doing practice and drills," said the father of four, who had played forward up to the junior C level. "I was like, 'Gosh, this kid.'" Now 21, Kyle Connor wrapped up the NHL regular season Saturday with a goal in Winnipeg's 4-1 victory over Chicago. It was his 31st of the season, keeping him at the top of all rookie goal-scorers. He added 26 assists for 57 points in 76 games. Centre Mathew Barzal of the New York Islanders led all rookies in points with 85 in 82 games, including 22 goals. Connor's achievement doesn't really surprise his dad, an engineering manager at a Michigan manufacturer of seatbelts, air bags and steering wheels. He first thought Kyle might have the potential to reach the NHL when his usually reserved son transformed on the ice at a Quebec peewee tournament in front of up to 5,000 fans. "He was one of our better players," said Joe, who was an assistant coach with the team. "But then when he played in front of a crowd, oh my god, he just hammed it up and just loved it. "He just took his game to another level." Kyle moved away from home at 15 to play junior for Youngstown in Ohio, then spent one season at the University of Michigan. Selected by the Jets in the first round of the 2015 NHL draft (17th overall), Connor had an outstanding freshman season with the Wolverines. He put up an NCAA-leading 71 points in 38 games and was a finalist for the 2016 Hobey Baker award, given to the top collegiate player. He will get his first taste of NHL playoff hockey when the Jets take on Minnesota in the opening round this week. His family plans to watch in person, including mom Kathy, 23-year-old Brendon, 18-year-old Jacob, and 17-year-old sister Krystal. "I think (the Jets) can definitely get to the (Western) Conference finals and anything can happen there," Joe said. 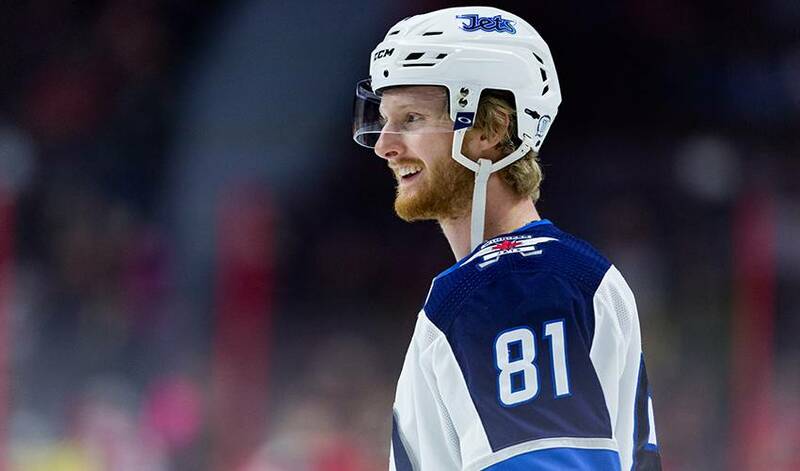 Kyle was sent down to the AHL Manitoba Moose after 19 games last season and only returned for the Jets' final game. This year, he played four games with the farm team before Winnipeg brought him back up when forward Mathieu Perreault was injured. He has found a place on the top line with centre Mark Scheifele and captain Blake Wheeler. Jets coach Paul Maurice has been impressed with Connor. "The things that he's doing now that are more important than the speed and the skills is his play without the puck," Maurice said. "(Wheeler and Scheifele) aren't carrying Kyle anymore. He's a piece to that line and he's driving the pace of that. That's what he's learned in his year." Connor knew there would be a learning curve after he turned pro. "Everything happens for a reason," he said. "In the long run, I think it really helped my career in development and learning the pro game. It's so much different than college and junior hockey." Kyle Connor figured he’d feel right at home playing hockey in Winnipeg. Turns out, he was absolutely right.